Today I am going to teach you how to parse a sign you see in Spanglish, and by parse, I mean consider how it came to be written how it is written, as opposed to in actual English, based on a previous knowledge of Spanish. Before I begin, I should mention that I recently was called out on Facebook for making fun of a misspelled sign. The sign in question said “frisaly” when the actual word was “physalis.” Which is also called golden berry, or in Peru, aguaymanto or in Colombia, uchuva and it’s tasty enough, except for the part where it makes me allergic just like kiwi fruit, though I can eat it when it’s cooked into jam. It’s pretty, looks like an orange cherry tomato, and each one comes in its own husk, just like a tomatillo, to which it is related. The person who called me out pointed out that there were educational and cultural differences between me and the frisaly sign maker and took me to task for making fun of people who work at the feria, with the (likely correct) assumption being they have had fewer opportunities than people who don’t work at the feria, such as myself. That is probably true, although we are all walking around with the internet in our pocket, and it seems like a quick google search (I just googled “frisaly fruta” which got me “physalis,” would have been handy. No worry, for I am not calling attention to the possibly woebegone sign maker. For one thing, who knows what I did with that photo. For another thing, I was making fun of the sign, not the maker, who I did not, and would not have taken a photo of. This newest sign, which I shall use for the parsing lesson was posted in the downstairs bathroom at Patio Bellavista, where I was for an event. Strangely, they did not comp us the bathroom that evening, and we had to pay, despite the fact that food courts and malls are required to have free public bathrooms, though maybe this was on the Providencia side, not the Santiago side, and there are many significant legal differences between these two comunas (parts of the city, perhaps most similar to boroughs). Patio Bellavista is a giant, sprawling freestanding food court, with everything from ice cream to crepes to an outlet of one of my favorite Nikkei places to Peruvian food to an Irish bar, and well, nearly everything in between. I am going to go out on a limb here and say that if there is a power differential here, it is not precisely in my favor. I have no restaurants. People do not come to my home to spend money. I don’t even have a public bathroom. So I feel it’s ok for me to call attention to this sign, in all its printed glory (frisaly was handwritten). Have I made enough of a difference in the two situations? I shall now unveil the sign in question. Also, this is for educational purposes, which makes it even more ok, or so I assure myself. So now, how to parse. First, identify the word that is not a word, and consider where it might have come from. I give you sheter. You may think that is an oblique reference to a toilet, and it may well be, but the more likely explanation is that someone looked up the word “caseta,” which in this case refers to the stalls, and found out that it can also be a “shelter.” Which, by the way, if I have never told you about the time I took a bus in the wrong direction and ended up in a snowy bus-turnaround in the middle of the pre-cordillera with bus drivers burning pallets for warmth and toasting deli meat on sticks and who offered me a cup of Fanta while I waited for the bus again (yes, I drank the Fanta, how could I not? ), please remind me to do so. That was when I learned the word caseta. And most of my vocabulary is similarly as storied. It’s crowded up there, trust me. 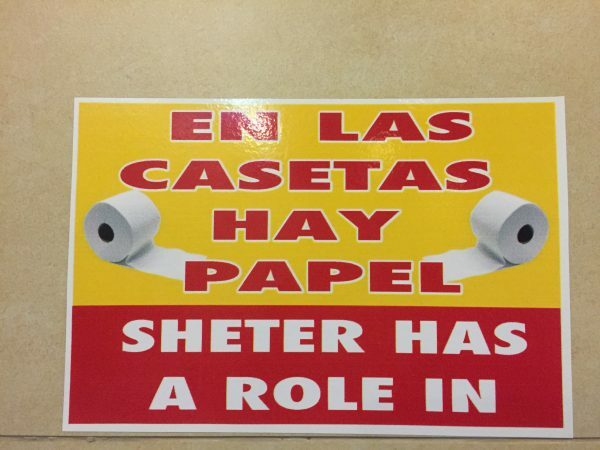 So, a caseta is a shelter, but poor shelter has lost its l, yielding sheter. But let’s understand that they mean stall. Stall has a role in. A role in what? a role in keeping the illusion of privacy? Or maybe they mean roll, as in roll of toilet paper. That could be, but one of the many definitions of the word papel is role. As in, to play a role in a play or movie (see what I did there, two different meanings of “play a role” in English). So there is paper in your stall. See? Easy peasy! Except what? Isn’t there always paper in your stall? Maybe in some places. But not in Chile. It is common in some establishments, like bus station bathrooms, sometimes movie theater bathrooms, for there to be one very large toilet paper dispenser on the way to the toilets, say, near the sinks, and no toilet paper dispenser (or toilet paper) in the stalls. I can assume this is either to shame people into not stealing toilet paper, or to make it easier on the attendant to not have to be constantly shuffling in and out of the multiple stalls to figure out where there might not be any paper left. It is also highly entertaining as a pastime to see how people spool the paper out on their hands, or collect it into a big wad before entering the stall, plus might play a role in (did it again!) the TMI that is public bathrooms, generally speaking. And there you have it: sheter has a role in, meaning: paper in booth. It only cost me 50 cents to find out if that was really true. Which was cheaper than the physalis. Which I’m not allowed to make fun of, and also, gives me hives. Good story on many levels…It’s true that we store our vocabulary in very special personalized ways (I have my own for the word “celosías”–blinds, though I never hear it used in Chile). I have heard celosías used for shutters, not blinds. I keep it in my mind as that you use them to keep your neighbors from getting jealous of what you have or how you live. Is that how you remember it? On the physalis sign, I try to be circumspect and accept that I might not always be right, and also not be rude/offensive to people who objectively have less power than me. So I took the criticism, though I’m still not sure about it. Thanks for your support, Eric! I gave up on sheter after a couple of minutes which was probably for the best as I was never going to get it. Should have got the other one as I do know papel/role but I only thought of toilet roll. Just found your site from the npr piece on marraquetas, which I adore. Am writing about the toilet paper in bathrooms…back when I lived in Chile in the early 80’s there was very rarely paper provided in public bathrooms…I quickly learned to always carry some “confort” in my purse. Generally the only time there WAS paper available, like in the airport, was because there was an attendant at the door who when you paid the nominal fee to enter would give you a small amount of toilet paper to clean yourself. Loved how you parsed the sign…sheter confused me when I saw it! the ladies with the boxes of wads of tp are still alive and well in many places, like on top of cerro san cristobal, or at many paid public bathrooms, like at the bus station. I wonder if you’d recognize Chile these days! It’s changed a lot since I got here in 2004. And do you miss marraquetas? Thanks for popping in!